Previews begin Wednesday, March 1 at 8 pm for Cameron Mackintosh’s acclaimed new production of Boublil and Schönberg’s legendary musical Miss Saigon, at The Broadway Theatre (1681 Broadway). The original production ofMiss Saigon opened at the same theatre on April 11, 1991 and played through January 28, 2001. 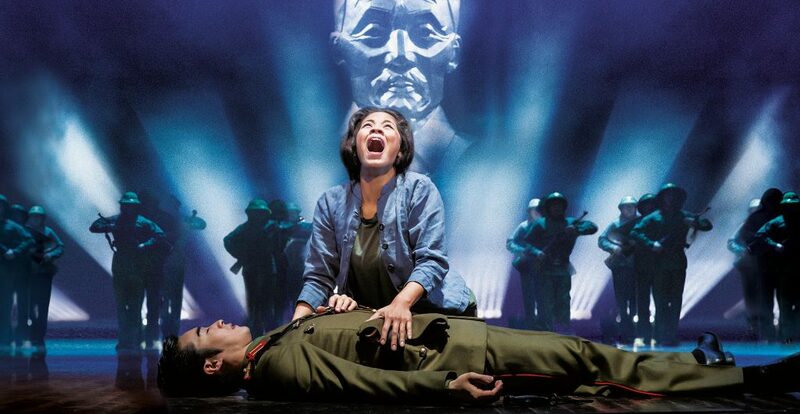 Directed by Laurence Connor (the recent hit revival of Les Misérables, School of Rock), the Broadway return ofMiss Saigon will feature four of its London stars: Jon Jon Briones as The Engineer, Eva Noblezada as Kim, Alistair Brammer as Chris and Rachelle Ann Go as Gigi. The cast also includes Katie Rose Clarke as Ellen, Nicholas Christopher as John, Devin Ilaw as Thuy. Lianah Sta. Ana will play the role of Kim at certain performances.Miss Saigon has its official opening Thursday, March 23 at 6:30 pm.Miss Saigon will play a limited engagement through January 13, 2018 before launching a North American tour. Miss Saigon has music by Claude-Michel Schönberg with lyrics by Richard Maltby Jr. and Alain Boublil, adapted from original French lyrics by Alain Boublil, with additional lyrics by Michael Mahler. The new production is directed by Laurence Connor with musical staging by Bob Avian and additional choreography by Geoffrey Garratt. Production design is by Totie Driver and Matt Kinley based on an original concept by Adrian Vaux; costume design by Andreane Neofitou; lighting design by Bruno Poet; sound design by Mick Potter; and projections by Luke Halls. Orchestrations are by William David Brohn; musical supervision by Stephen Brooker and musical direction by James Moore. Casting is by Tara Rubin Casting / Merri Sugarman CSA. Miss Saigon tells the story of the last days of the Vietnam War, when 17-year-old Kim (Eva Noblezada) is forced to work in a Saigon bar run by a notorious character known as the Engineer (Jon Jon Briones). There she meets and falls in love with an American GI named Chris (Alistair Brammer) but they are torn apart by the fall of Saigon. For three years Kim goes on an epic journey of survival to find her way back to Chris, who has no idea he has fathered a son.